If you are undertaking academic study at an English speaking institution or university, then it is important that you understand the difference between works cited and a bibliography. Depending on the professor’s course requirements you will be required to produce both of them accurately as part of your assignment and essay work. In general a works cited is a smaller list than a bibliography. When producing a works cited for an essay you only list the actual sources of information that you referenced in your piece of work. A bibliography, on the other hand, lists all the works and sources of information that you consulted while undertaking research into your paper. For example, when you are writing an academic piece it is necessary to consult many different empirical sources to underpin your arguments and points. These can be books, magazines, academic volumes, web sites and any other source of information. When you write your academic paper it is usually necessary to quote or paraphrase these sources of information and draw your own conclusions from that supporting information. The authors and information that you directly quote or paraphrase must be referenced in your writing and included in a works cited. If you do use authors’ words without referencing them your professor may consider that you have plagiarized their work. A bibliography may also include works that you have directly quoted or paraphrased in your academic writing, but it can also include research that you did and did not end up using directly in your essay. Both works cited and bibliographies must be set out according to specific requirements. The most common format is MLA or APA style. Works cited do not generally list works nurmerically, whereas bibliographies generally are numbered. Sources of information are usually listed alphabetically according to the author’s surname. References can either be included in your written essay as footnotes or in parentheses; however parentheses tend to be more favored in academic writing these days since they do not tend to interrupt the reading flow in the same way that footnotes can. 1. Works cited list on the sources that you used directly in your essay. 2. 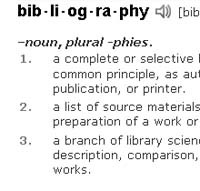 A bibliography can include material and sources that you consulted, but did not directly reference in your writing. 4. Both works cited and bibliographies have a specific format that must be used. 5. References can be done using footnotes or parenthesis. Rachel. "Difference Between Works cited and Bibliography." DifferenceBetween.net. November 12, 2009 < http://www.differencebetween.net/language/difference-between-works-cited-and-bibliography/ >. Difference has been given in a very easy and clear laguage.One can easily understand and use it accordingly. found it very useful for writing essays. good work, keep it up. Very nicely written; informative without being complicated. My only suggestion is to add references from peer-reviewed scholarly sources to strengthen the integrity of the post.